So it has been a while! When you run your own small business, when real life stuff happens it tends to get in the way of your work, and after the hectic run up to Christmas, real life really kicked my behind, that and then the traditionally quiet time for retail in January then turned into being quiet on the Black Heart Creatives front in general. However, I had a lot of time to think about what we wanted to do next with BHC, and it being January my inspiration from my surroundings was inundated with diet things being rammed in our faces in magazines and adverts on TV, Facebook and Twitter. I have wanted to do a food collection for a while, but wasn't sure what direction I wanted to take it in. People have asked me to do savory pieces before, and that was definitely a starting point. I also knew I wanted to make the pieces look slightly cartoonified, as so to make the pieces look even more inviting, for example the donuts on the Simpsons always look way more inviting than an actual Krispy Kreme, and don't get me started on Krabby Patties. So we went as anti diet as possible, and chose the choicest most delicious 'junk' and 'comfort' foods we could think of. So after lots of planning and designing we present to you the 'Live Fast Die Yum' collection! A statement we can get behind! 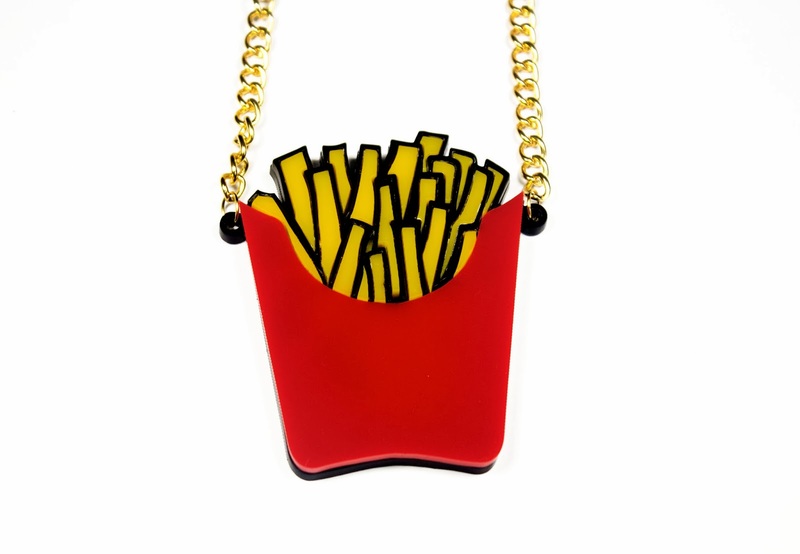 A red carton with the collections unmistakable outline framing the mish mash of skinny fries, this necklace definitely represents the live fast, die yum lifestyle. What encompasses comfort food as much as a sticky, glazed, sprinkled ring donut? Nothing. 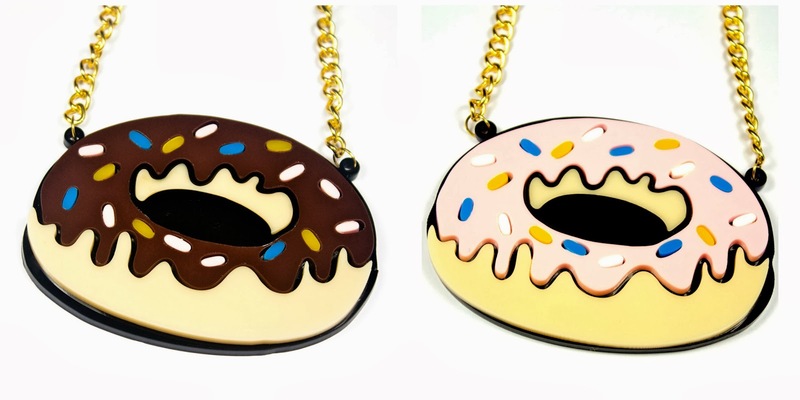 The necklace comes in either pink glaze with white, blue and yellow sprinkles, or brown chocolate glaze with pink, yellow and blue sprinkles. Looks particularly good with the new chunky gold chain we are offering with this collection. This hawt dawg comes in a bun with mustard, (like all good hot dogs should) and even has a little knot at the end like the real thing! We tried brown at first to represent the dog, but then we used a new colour; a red/maroon acrylic that brings the whole thing together perfectly. Chocolate is most peoples go to comfort food, and we wanted to capture it in its purest most decadent form. With an old fashioned foil wrapper, we used mirrored acrylic to show the torn bits of foil, and a royal purple for the paper piece. The chocolate itself is large chunks (with BHC engraved on each square) and a large bite taken out of it. 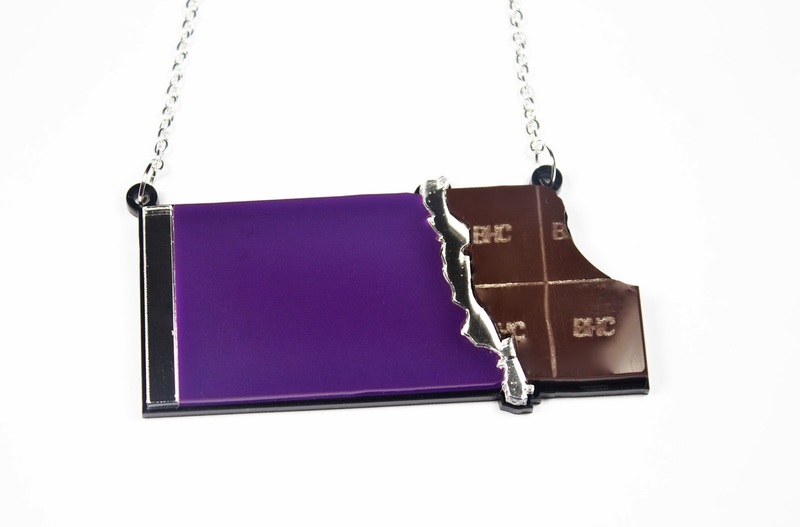 This necklace really depicts the furious unwrapping of a big bar of chocolate to satisfy your chocoholic tendencies. 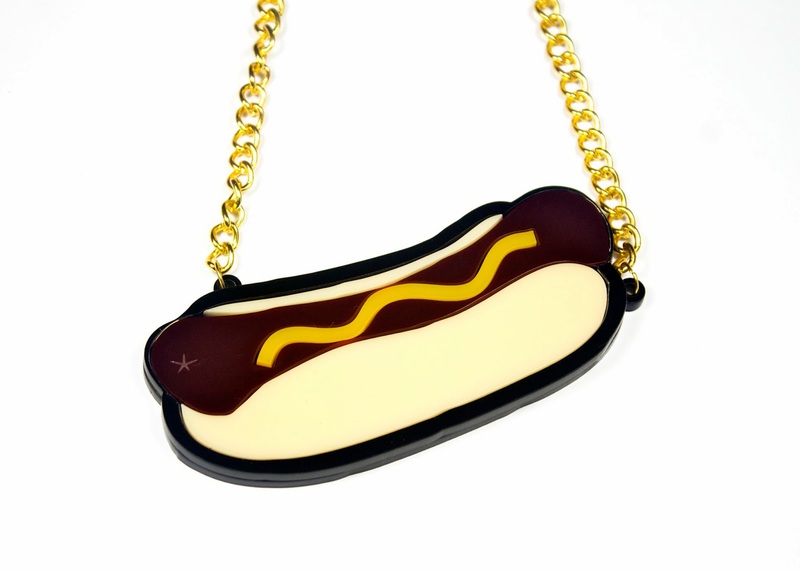 Burgers are our LIVES over at Black Heart Creatives, we are constantly on a quest to find the holy grail of burgers (if you are interested we recommend Bodeans, Meat Mission, Five Guys, Atomic Burger, Grillstock, and the Swan in Cheltenham, ALL are worth a long trip) and this necklace was very important to us. 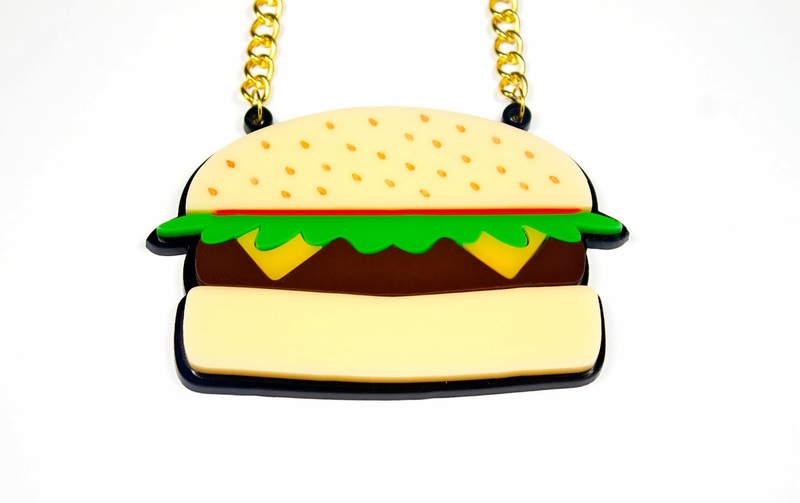 We know there are other burger necklaces out there, but none seem to encompass what we would call our ~dream burger~. With a sesame seed bun, tomatoes, lettuce, and cheese on top of a huge patty you will want to eat this (please don't eat this). As blog followers we are giving you an exclusive 10% off the Live Fast Die Yum collection! Use code BLOGYUM10 at the checkout, code expires on 5th March 2014. I absolutely love the names of these pieces! !